Also linking up to the "Men in our Lives" challenge over at Scrap & Stamp Saturday. I used this week's sketch (#241) from Pencil Lines. Have a great weekend!! It's still raining here in Calgary - - only upside to that is I should get lots of crafty time in this weekend instead of the yard work I had been planning! Very cute page! Love the splash of red you used - thanks for joining in at Scrap and Stamp! 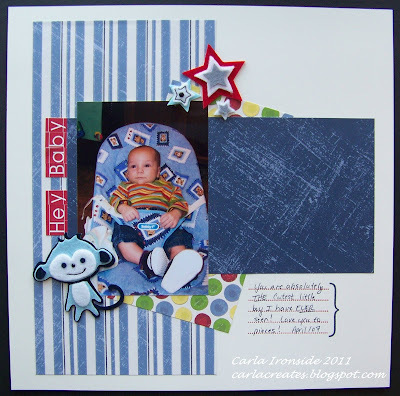 Cute layout & CUTE baby, Carla! The papers go so well with your photo. Love those layered stars too! This is a lovely take on the sketch, BRAVO ! Great lo Carla!! I love the little guy from the Oliver line! Your little guy is a cutie!! I just picked up Dirty Dancing the other day to add to my Gotta Have Chick Flicks Collection!!! Thanks for joining us at Scrap & Stamp! !